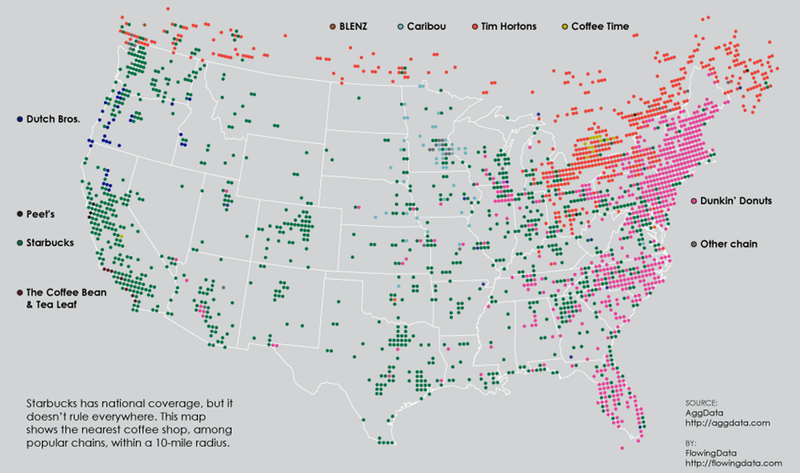 Big shocker here: according to Flowing Data's map of U.S. coffee chains, Starbucks dominates across the entire U.S., and Dunkin Donuts has a massive foothold on the East Coast. Apparently that stereotype about Boston residents loving their DD is true. The map, which shows the nearest chain within a 10-mile radius, shows that even though Starbucks is the most prolific nationwide, it's not necessarily the favorite within particular reasons. The Midwest, for example? Well they're pretty attached to Caribou. Starbucks, meanwhile, is most popular in its home region of the Pacific Northwest. Then there's quite a consistent selection of Seattle's Best throughout the country, but once again, it doesn't come close to Starbucks' omnipresence. Oh, and of course, it wouldn't be a coffee map without a smattering of Tim Horton's up in the Great White North.